This card was inspired by three challenges: Global Design Project #49 for the colours, Tuesday Morning Sketches #365 for the design and Stamp Ink Paper challenge #61 for the elements (I chose Green + Sequins + Flowers in the tic tac toe grid). The sequins element made me think to turn the frame from the Painter's Palette stamp set into a shaker frame. I picked sequins from the Brights and Metallic packs to match my color combo. A little punched flower was added at the top of the frame, and the sentiment was embossed in Copper Stampin' Emboss powder. The card background was created using the paint strokes from the stamp set, and the splatter image was also embossed in copper powder. I used the 2016-2018 In Color Envelope Paper and Envelope Punch Board to make a matching envelope, and I used a scrap of paper from my sheet to mat the frame and make it stand out better against my background. I punched a slit and used a piece of Flirty Flamingo ruched ribbon in it, tied with a piece of the burlap ribbon I had previously pulled apart for another project. The corners were rounded using the Project Life Corner Punch. Oh my goodness! This card is so fun! Thank you for joining us at Tuesday Morning Sketches. That's awesome! Love those bright colors, the background turned out perfectly! Thanks for joining us at Stamp Ink Paper, hope to see you again soon! Wow! This is so gorgeous and fun! I love all the detail. Thanks for the inspiration and for joining in with this week's Global Design Project! This is a fantastic card Cindy, I love the shaker/tag combo! 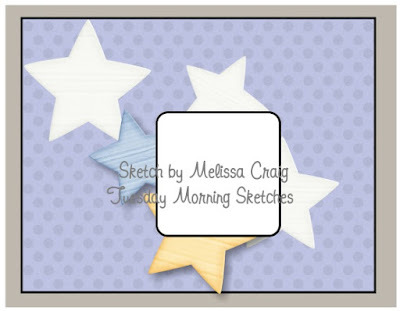 Thanks so much for playing along with us at Tuesday Morning Sketches. Love this colorful card. Very creative. Love this card. The colors are so happy and bright. Thanks for joining us at Tuesday Morning Sketches. 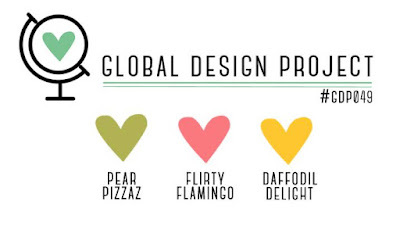 I am way behind on checking out the Global Design Project entries ... I am just stopping by to say hello! Great card. - Krista Frattin from Canada.